Western blot analysis of extracts from Akt1, Akt2 or Akt3 -/- mouse embryonic fibroblasts using Akt2 (L79B2) Mouse mAb (upper) and Akt1 (C73H10) Rabbit mAb #2938 (lower). 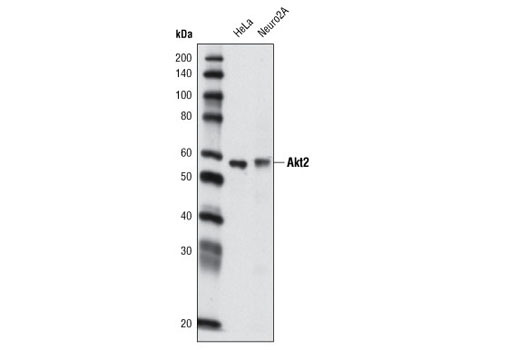 Western blot analysis of extracts from HeLa and Neuro2A cells using Akt2 (L79B2) Mouse mAb. Akt2 (L79B2) Mouse mAb detects endogenous levels of total Akt2 protein. 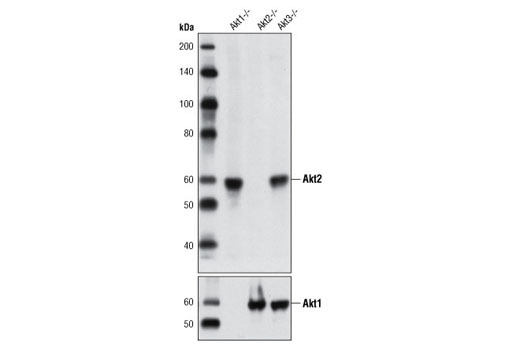 This antibody does not cross-react with Akt1 or Akt3. Monoclonal antibody is produced by immunizing animals with a synthetic peptide surrounding Leu110 of human Akt2.